The sizzling summer holiday show for all the family! 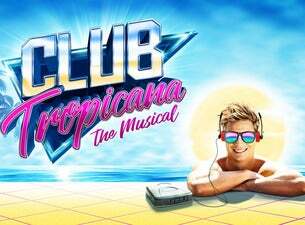 Welcome to the Club Tropicana Hotel – the 1980s answer to Love Island – where the drinks are free and the whole family is invited to join the ultimate holiday musical, celebrating all that we love about the 80s. This star cast is led by Joe McElderry (X Factor winner, Joseph and the Amazing Technicolor Dreamcoat), Neil McDermott (EastEnders, The Sound of Music), Kate Robbins (Spitting Image, Dinnerladies), Emily Tierney (Wicked, The Wizard of Oz); and former Sugababe star Amelle Berrabah. Set to the most iconic pop anthems of the era, performed live on stage including Just Can’t Get Enough, Take On Me, The Look of Love, Girls Just Wanna Have Fun, Relax and many more! Book your first-class ticket today to see the feel-good musical of the summer.